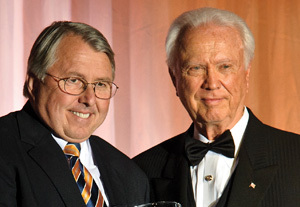 Phillips is often referred to as the “architect and administrator of the Pepperdine University School of Law.” He served as dean for 27 years before becoming Dean Emeritus in 1997. A member of the state bars of California and Texas, the American Bar Association, the American Law Institute, the Los Angeles Bar Association, and the Christian Legal Society, Phillips was a California commissioner of the National Conference of Commissioners on Uniform State Laws from 1988 to 2003. A Life Fellow of the American Bar Foundation, he was the chair of the section on the Administration of Law Schools in 1982, and was on the Committee on Courts from 1985 to 1987. He is admitted to practice before the U.S. Supreme Court and U.S. Court of Military Appeals.